Kick off the holiday season with a tasty breakfast, photos with Santa and story time with a local author Saturday, Nov. 18, at 8 and 10 a.m.
Children and their families can enjoy a festive morning at this ticketed event. Breakfast with Santa includes breakfast from Wildberry Cafe and Catering, and parents can bring their cameras to take free photos of their children with Santa. 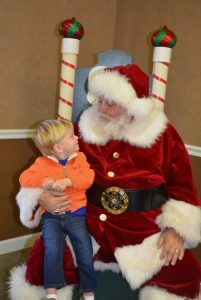 Breakfast with Santa will be at the James E. Ward Ag Center (Wilson County Fairgrounds), and tickets are $15. Each breakfast time has a limit of 60 people, so purchase your tickets before they sell out! Your ticket is your receipt, so print and bring that with you to the event. BUY TICKETS FOR 8 A.M.
Tickets for 10 a.m. are sold out.